After catching the 4 ½ hour night flight from Toronto, as the plane touched down in Las Vegas I was amazed at the fact that I could see some of the buildings, such as the Luxor, complete with sphinx and pyramid, from my aeroplane window. Last time I was in Las Vegas none of this existed. It was 1981 and Fremont Street was the hip-hop-happening place. Now that area is called Downtown (The Fremont Experience) and people go there for nostalgia. Given the choice of a shuttle for $7 per person, or a taxi, we chose the latter because we were so tired and which, with tips, cost $20. Arriving at the hotel 11.30pm local time, but three hours later on our watches, indicates why we felt a certain amount of exhaustion. The first thing I noticed when we entered Planet Hollywood, was the really loud music, the type of which I do not like. Doof-doof rap – ugh! Anyone who knows me knows I am a strictly middle-of-the-road girl, with a few rock’n’roll exceptions. I prefer elevator music to that, but wait, it was playing in the lift as well. And I was tired, adding to the fun. To get free internet, you had to go down to Starbuck’s on the Casino floor. Otherwise, it would be $14.99 per day. Two great big queen sized beds were in the room, and as we desperately needed a thoroughly good night’s sleep, we took one each to spread out. 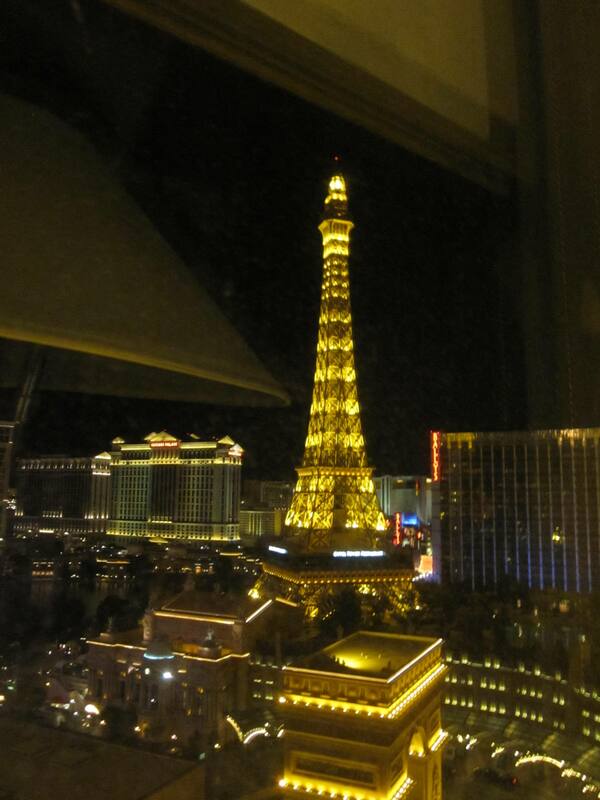 Before we went to bed though, we had to look out the window and admire the view of the Bellagio fountains, which put on a splendid show, although having just been to Niagara in a hotel room overlooking the Falls, the magic of this view was slightly tainted. I think sometimes you can do too much and then not truly appreciate what you are seeing. What I did adore though, was the view of the Paris hot-air balloon, and looking to the right of our window, something I have always aspired to; a hotel overlooking the Eiffel Tower. Imagine the astronomical prices in the real Paris to garner a scene such as this! That made my day, particularly as I wasn’t expecting it. The beautiful big oval tub in the classy bathroom was great too. There are various places in Las Vegas where you can buy discounted tickets for shows, similar to New York and London. Why pay full price if you don’t have to? 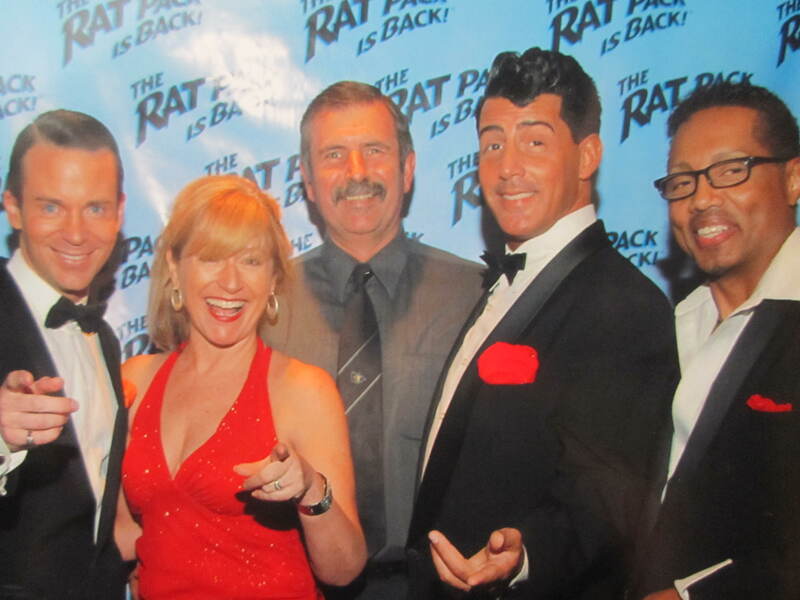 Because Frank Sinatra, Dean Martin and Sammy Davis Jr. were famous as the ultimate entertainment in early Las Vegas, we chose The Rat Pack is Back at the Crown Theatre in the establishment called Rio. These guys were fabulous, and they had the voices, the mannerisms and the looks. Photographers were ready after the show to take more of our money, which we did willingly in this case. Needless to say, it’s hot in the desert, so I decided to try out the swimming pool. Unfortunately, the DJ had a penchant for music that I don’t like. Give me the Rat Pack above the Crap Rap any day. He did take requests, so he played some Lady Gaga for me. I had chosen something modern because I doubt he would have had other types I like. If you wanted the day beds with cushions it cost $65 for the day, and a cabana was about $300! 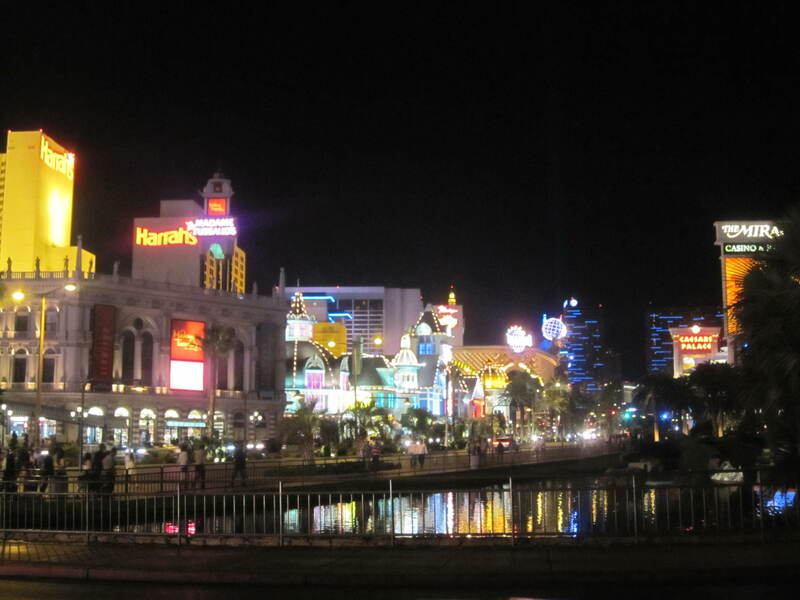 Oh well, this was Las Vegas at the fancy end of The Strip. I spent an afternoon at the day spa, but not at Planet Hollywood, where an eyebrow wax would have cost $35! I took the bus down to a salon so I could have my eyelash extensions re-done, and various waxing treatments plus some reflexology as my feet and Achilles were rather sore. I felt a million dollars when I left, ready for the upcoming cruise. A sad note to this is that the eyelashes did not last as they should, but I had no recourse once I was in Hawaii. Disappointing but it’s something over which I have no control. Obviously it is better not to go away for too long then. As you can see by the photograph, Dutchy has been working out (I wish). Las Vegas, the land where fantasies can come true. Thank you, Mr Photo Man at Fremont Street! We managed to get tickets for Cirque du Soleil performing at The Mirage. In 1999 we took our daughters to see Cirque du Soleil Saltimbanco, so it was a long time between visits. This show is set in the round, and is based on songs of The Beatles, so we knew we would definitely like the music. Their interpretations of each song were fantastic, and I would highly recommend this show. Dutchy was so impressed he bought the DVD of the making of it, which I trust will play in at least one of our DVD players at home, which I hope are multi-zone. When planning this trip, I had decided I wanted to play the roulette tables in Las Vegas, and I would be prepared to donate $100 to a casino of my choice. I chose The Mirage, because as soon as we walked in I felt comfortable. It had lush green tropical foliage and a lovely atmosphere. 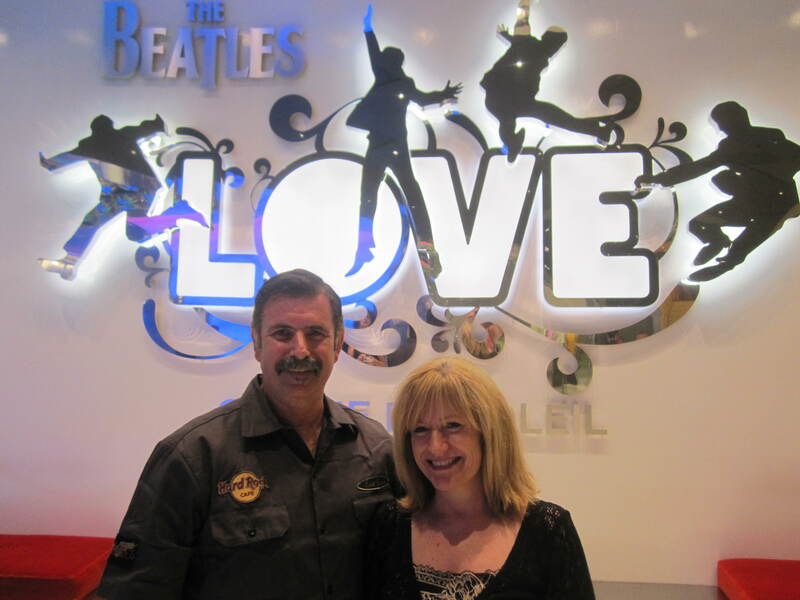 After the extremely enjoyable Cirque du Soleil we made our way to the casino floor. The minimum bet was $10, so I figured my money wasn’t going to last very long. Earlier I had even chosen the number I was going to play: black 26, because both our daughters were born on the 26th and I met my husband Dutchy when I was 26. I placed my first chips on the table. The wheel spun, and number 29 came up, which is next to 26 on the table. Next spin, number 23 came up, which is on the other side of 26. Then number 9 came up, which is next to 26 on the actual wheel. So close and yet so far. By the next spin I had outlaid $80 on the table, when to my delight my number came up!!! With odds of 35 – 1 this was great news. Dutchy suggested I step away from the table, but I wanted to have a little more fun, so I played with some of my winnings but kept most of them back, with the intent of buying something to commemorate my win later on the trip. 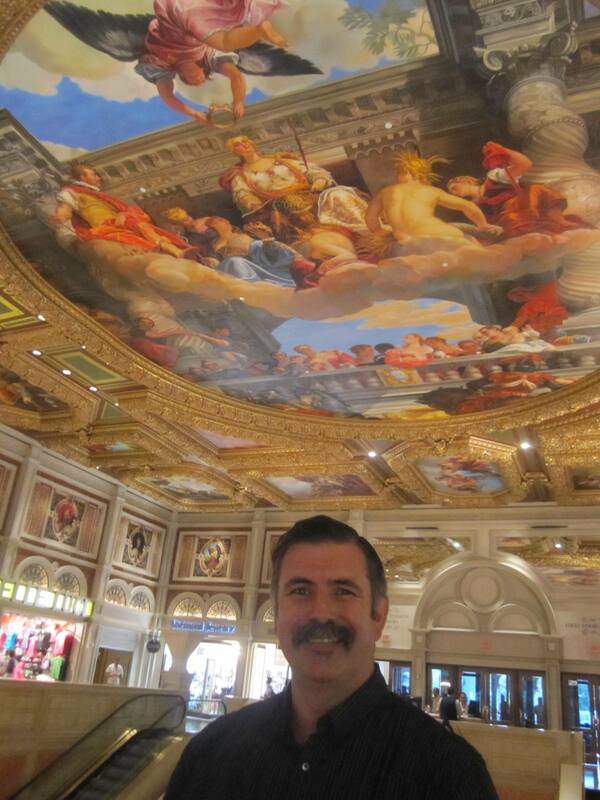 That experience certainly improved my impressions of Vegas! Many years ago, on my first trip to Las Vegas, I met a wonderful guy named Michael Kendall. Though our relationship was brief, he taught me a lot about myself. We stayed in touch spasmodically over the years and I was looking forward to the day we would meet again. Unfortunately, he is no longer with us, so returning to Vegas was bittersweet. However, on the upside I met up with his delightful sister Gena, and we sat at Starbuck’s sharing fond memories of a wonderful person, whose time on this earth was too short. This entry was posted in Las Vegas, USA and tagged Cirque du Soleil, Planet Hollywood, The Rat Pack, Vegas shows. Bookmark the permalink.